Telomeres are found at the end of chromatids and prevent chromosomes from deteriorating as they are replicated. As these run out in the human body, the amount of times that cells can duplicate is limited. They therefore can so control the lifespan of the organism. Tumours can activate Telomerase making them biologically immortal and able to replicate rapidly. This allows the tumour to thrive without ageing. This article investigates the potential of using Telomeres in the fight against cancer and the eventual possibility to slow down the ageing process of the human body. The definition of senescence is the scientific term for biological ageing; the definition of which is the change in the biology of an organism once it has reached maturity. Senescence progresses through cell divisions and in order for DNA in a chromosome to remain undamaged, it needs telomeres as shown by the white caps in Figure 1. 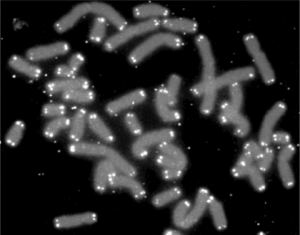 A telomere is DNA that does not code for anything, but is merely ‘a repetitive nucleotide sequence’, and this prevents the damage that would otherwise happen to the chromosome. During cell division, when DNA is being replicated, Okazaki fragments (strands of RNA containing 1,000-2,000 nucleotides) need to be connected together to form DNA after the last RNA primer has attached. Unfortunately, in order for the Okazaki fragments to connect together, bits of the RNA need to be cut off. Therefore, over time, telomeres or, meaningless DNA that codes for nothing, have evolved so as to prevent useful DNA from being left out. These telomeres have the code TTAGGG repeated many times. However, over time the number of telomeres in the body decreases. Humans begin with around 7,000-10,000 nucleotides worth of telomeres, but due to cell duplications in every cell, humans lose around 31 each year. This means that over time the body begins to run out, which limits the number of times a cell can divide. Consequently, in older people, the cells cannot duplicate when tissue needs to be repaired, and as a result, healing is slower and the body deteriorates as cells age and reach apoptosis or cell death. For this reason, the longer an animal’s telomeres are, the longer its lifespan is. 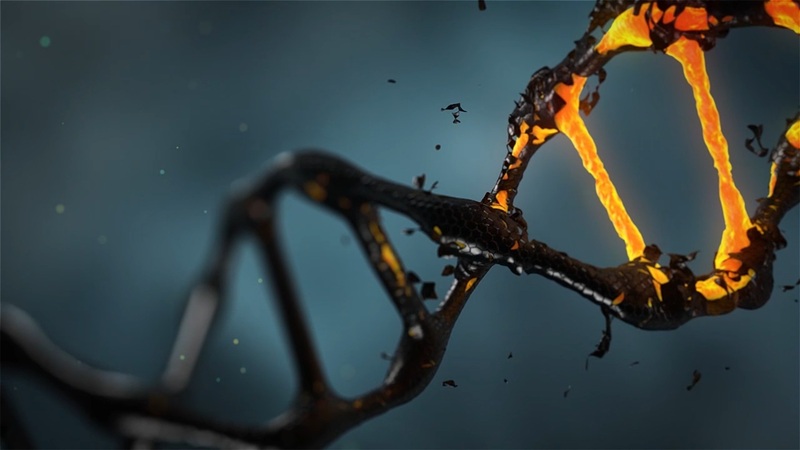 The (whatever damage it is) damage to DNA is most often caused by free radicals and as humans age, less can be done to repair the DNA and, therefore, life-threatening mutations can persist. have replicated so much over time that there is now 400 times her body weight in cells worldwide. These cells have not aged at all and can in essence be replicated indefinitely. This is purely down to excellent telomerase which replaces the lost telomeres and thus means that cell division does not get obstructed. As a result, it draws comparisons to prokaryotic cells. In Prokaryotes, while the cells do die (like in the HeLa cell line), the colony line theoretically never ends as cells have an unlimited ability to replicate. There are also others within the animal kingdom that could theoretically live indefinitely, including lobsters and jellyfish.  The latter uses a different technique called trans-differentiation, which in essence is the creating of embryonic stem cells and using these to replace the old cells and add a new cell line. However, this is a different type of biological immortality and it is not known to definitively produce immortality, but does allow the jellyfish/lobster to not age during its brief lifespan whilst continuing to get larger. This is the mortality graph for a type of fly [Figure 3], but the vague model is applicable to most eukaryotes. As humans age and telomeres get shorter, chance of death increases from mutations causing a problem with bodily functions or even death. Mortality rate appears to go up exponentially until inexplicably it reaches a plateau, even if it is at a high rate. In humans, at the age of 110, the chance of surviving another year is around half and the chances of dying will not fluctuate. This is relatively inexplicable, but some believe the telomerase is re-activated and produces just enough to keep the body working. This is because, at such late ages, no evolutionary selection will have occurred so no more selective mutations can occur. Therefore, the chance of death will not increase and the person will continue to live. Theoretically, this plateau will never reach 100% mortality. Tumours activate telomerase which helps them to divide in large quantities without ageing. However, it does put the tumor at a risk. If humans were able to design a telomerase inhibitor that prevented tumors from negating the shortening of telomeres, the tumor would die by dividing excessively and causing apoptosis. By doing this, further duplication could be prevented after a maximum of eight duplications, thus halting the process of cancer. The tumor would become vulnerable to chemotherapy, or in the case of a brain tumor, the cells could be prevented from advancing any further. using the Methuselah fly. Researchers bred the oldest living flies in each generation and managed to double their lifespan from 60 days to 120 days, with the breeding taking place where the death would have usually occurred. However, this method is impractical and unethical with humans, although people are naturally having children later. 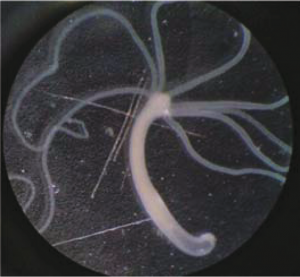 Theoretically, there is also the use of trans-differentiation of stem cells, such as in jellyfish. Replenishing the existing stock of cells in the human body with new cells that contain telomeres that have not been shortened, could only have hypothetical success in an organism as complex and with as many cell types as humans, so it may be some time before humans can live forever. Pedro de Magalhães, Cellular Senescence; 1997. Available from: http://www.senescence.info/cell_aging.html. [Last accessed on 2012 Jul 27]. Colm G. Okazaki fragments; 2012. Available from: http:// en.wikipedia.org/wiki/Okazaki_fragments. [Last accessed on 2012 Jul]. Zheng L, Shen B. Okazaki fragment maturation: Nucleases take centre stage; 2011. Available from: http://www.ncbi.nlm.nih. gov/pmc/articles/PMC3030970/. [Last accessed on 2012 Jul]. Cawthon R. Are Telomeres the key to Aging and Cancer? Available from: http://learn.genetics.utah.edu/content/begin/ traits/telomeres/. [Last accessed on 2012 Jul]. Callaway E. Telomerase reverses ageing process; 2010. Available from: http://www.nature.com/news/2010/101128/ full/news.2010.635.html. [Last accessed on 2012 Jul]. Greider CW, Blackburn EH. Telomeres, Telomerase and Cancer Available from: http://www.genethik.de/telomerase.htm. [Last accessed on 2012 Jul]. Biosystems A. Hela cell line. Available from: http://helatransfection.com/. [Last accessed on 2012 Jul]. Bai N. The curious case of the immortal jellyfish. blogs. discovermagazine.com; 2009. Available from: http://blogs. discovermagazine.com/discoblog/2009/01/29/the-curiouscase-of-the-immortal-jellyfish/. [Last accessed on 2012 Jul]. 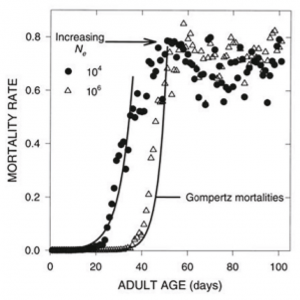 Mueller L, Rose M. Evolutionary theory predicts late life mortality plateaus. Available from: http://www.pnas.org (late life mortality plateau). [Last accessed on 2012 Jul].